Today it is a National Park. You can see the original paint on the sleigh runners. An unique historical piece become “Art” to enjoy and one of the items created by Cowboy Ron. Here is a picture for to enjoy and perhaps you may wish to get for yourself or someone you love. Also here is a picture of me in the streets of the historic Mining Ghost Town back a few years ago. I shot up the town and think I killed every ghost I saw! Finally, it’s safe to visit it. The Mine is still there and you can go online and view all kinds of cool buildings, bars, general stores and homes. his is a 19th Century Genuine Old “Milk Sled” came out of the famous Gold/Silver Mining “Ghost Town in Bodie, California.” Today it is a National Park. You can see the original paint on the sleigh runners. 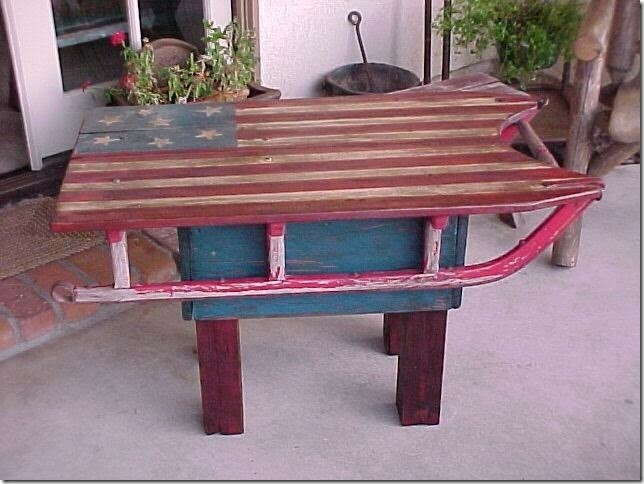 I painted the Folk Art American Flag on it many years ago and it made a great side table and coffee table for our home. Cowboy Ron An unique historical piece become “Art” to enjoy and one of the items created by Cowboy Ron. Here is a picture for to enjoy and perhaps you may wish to get for yourself or someone you love. Also here is a picture of me in the streets of the historic Mining Ghost Town back a few years ago. I shot up the town and think I killed every ghost I saw! Finally, it’s safe to visit it. The Mine is still there and you can go online and view all kinds of cool buildings, bars, general stores and homes. Great Old West history. Please email cowboycabin@centurytel.net with questions or call 406 270-2842.